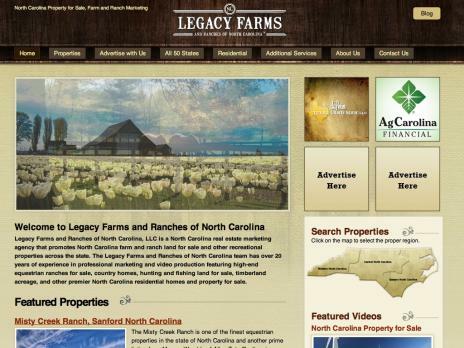 Legacy Farms and Ranches of North Carolina, LLC is a North Carolina real estate marketing agency that promotes North Carolina farm and ranch land for sale and other recreational properties across the state. This entry was posted on Thursday, January 20th, 2011 at 1:30 pm	and is filed under Real Estate, Well Designed Websites. You can follow any responses to this entry through the RSS 2.0 feed. Both comments and pings are currently closed.